Being a destination wedding photographer means we have been fortunate to work with amazing couples around the world. While our specialty is Mexico destination weddings, we have traveled to 30 countries for weddings including one of our favorites in Europe: Barcelona, Spain! With Gothic churches, Old World villas, historic castles, and classical gardens as options for ceremony and reception locations, Barcelona is a romantic destination for a wedding. 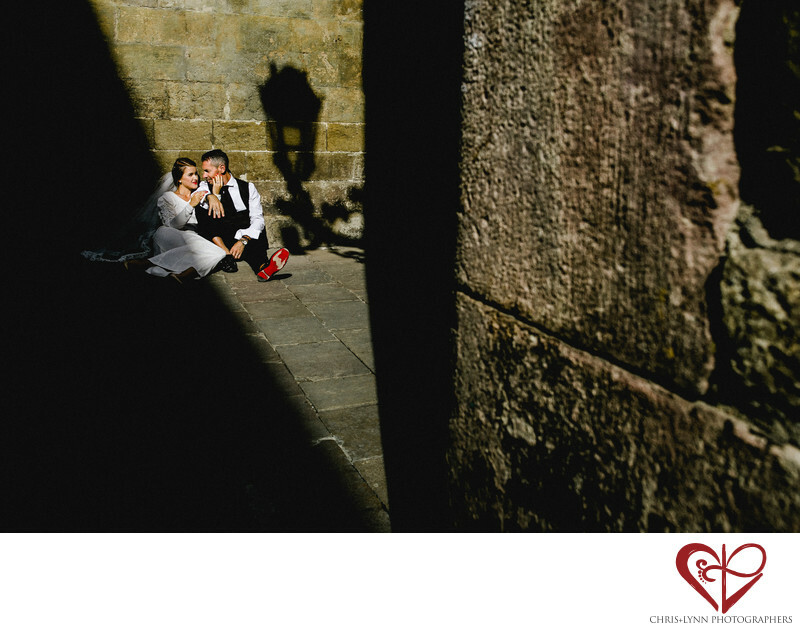 We photographed this couple in the Gothic Quarter, the heart of Barcelona's Old Town. The Gothic Quarter, with its labyrinthine streets and medieval squares is one of the city's most recognizable and popular neighborhoods and offers many opportunities for photography. We love the distinctive character of this area and the way the narrow alleyways and tall buildings create unique lighting situations with strong shadows. The challenge with this area and all famous landmarks that attract a lot of tourists, is finding privacy for the couple, making them feel comfortable when so many other people are around, and creating images that either incorporate the tourists as an element of composition or use creating framing to remove their presence. For this image, we searched out a corner of the Gothic Quarter that was less busy to spend some time with the couple. While the hour prior to sunset is always the best time for portraits in soft flattering lights, sometimes the wedding day schedule does not allow for that. Being a good destination wedding photographer means being able to create images at all times in all types of situations, even those that are not optimal. This spot attracted us because of its harsh light, distinct diagonal lines, and the shadow of the lantern. We positioning ourselves and the couple to create a strong triangular composition. I love how the shadows lead the eye to the couple and their affectionate interaction. The bride's red lipstick and the groom's well worn red Louboutin shoe soles add a burst of color and interest. Location: Latin Quarter, Barcelona, Spain. 1/500; f/8.0; ISO 100; 35.0 mm.